Today, I stopped by the Apple store to replace my Pogo stylus. While I was there, my wife visited the Brookstone store across the aisle. I had stopped my ritual visit to Brookstone because they appeared to not be keeping up the level of gadgetry that had expected. Since Apple, I had been waiting for iPad related accessories. My wife appeared in the Apple store to ensure my activities did not include making any purchases. When we left the Apple store, she handed me the new Brookstone catelog. To my delight, it included some iPad accessories like a speaker add-on that caught my attention. I decided to make an appearance at Brookstone. The speaker add-on was only available from their website, so I was not able to see one in person, but to my delight they had a new iPad case with a Bluetooth enable keyboard built right into the case. 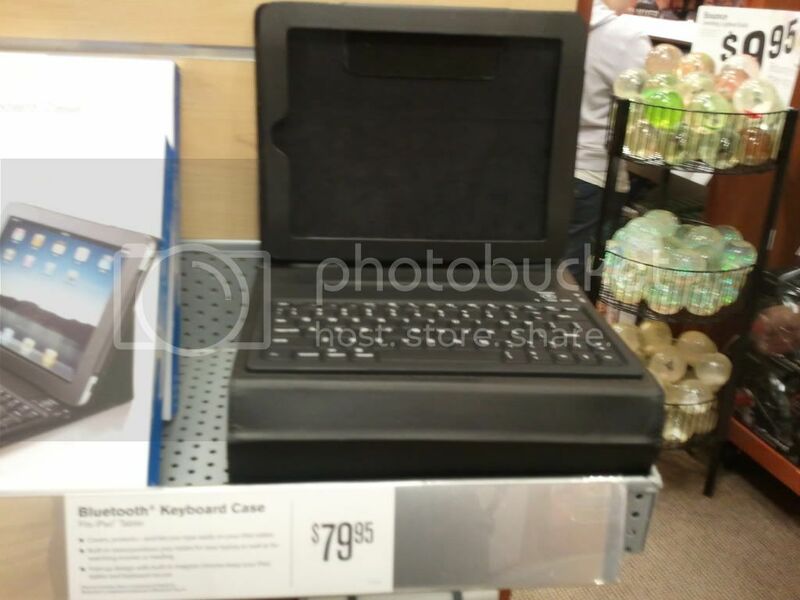 The Brookstone Bluetooth Keyboard Portfolio is a leather iPad portfolio case with a built-in rechargeable Bluetooth QWERTY keyboard. Just flip open the case and the keyboard is right there. 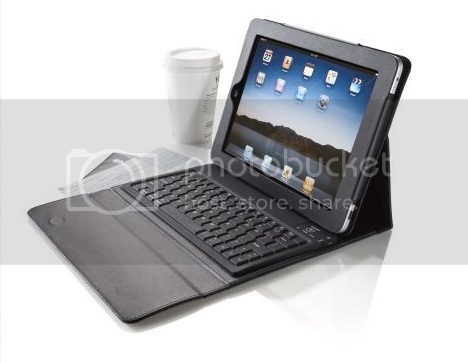 The case also can be used as a stand to make your iPad more like a netbook or laptop. The keyboard comes with a charger and can be used for up to 90 hours on one charge. The case has a couple of flaps to hold it together. The first flips around the edge of the iPad after you slide it in from the top. This ensures that the iPad does not slide out. The second flap has a magnetic enclosure that holds the entire case shut when not in use. I whipped my iPad out of my own case and slid it in. I launched the Bluetooth settings on the iPad, tapped the pairing button on the case's keyboard and typed the pairing code when prompted and was in business within seconds. After typing for a bit, I closed the case to test the magnetic closure. At first it feels as if the case is too thick to close, but it does and feels very snug and secure. The iPad's built-in keyboard is cool but there are times when typing on glass, with no feedback from the keyboard, just doesn't cut it. I have a small portable Bluetooth keyboard from Logitech, but this one is much more convenient since it's always there and ready to go. The keyboard keys are rubber so they do not harm the screen when the case is closed. The built-in keyboard will adds some bulk to your covered iPad, coming in at 1-inch thick when the iPad is in the case. I think the case is well done and affordable at $79.99. My Logitech diNovo Mini keyboard, which I am using to type this story, is over $100 and has no case with it - plus I have to have something to carry it around in. If I bought the official Apple Bluetooth keyboard and the official Apple carrying case, I would be over $100 again and still need a bag to carry the keyboard around in. Just as I was thinking about giving up on Brookstone as a relevant source for my gadget needs, they came through with flying colors. Now to start hinting to the wife for a Christmas gift, even though I will be getting my new Wallet case from Happy Owl Studio soon. You can never have too many options for looking cool. I find that the keys are slow to respond. Am I doing something wrong? I type kind of fast.